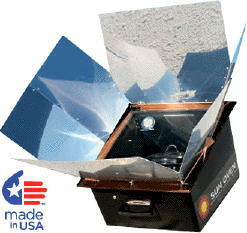 Use a solar oven. It’s remarkably easy to use and gets plenty hot — 300-350°F. And somehow foods don’t seem to burn. We can put something in the oven and then even if we forget about it for hours, it’s just fine later. The unit pictured is the $260 Global Sun Oven. The payback time for me was about ten years, but you know what? I’ve owned mine for 13. Also, my goal with saving energy isn’t just to save money, it’s to reduce my pollution footprint by consuming less resources. Finally, this thing is just plain fun to use. Use a crockpot or a microwave oven for baking. Besides a sun oven, these are the cheapest ways to bake. Open the oven door only when necessary. Oven temperature drops 25-30 degrees every time you open the door. Getting an oven with an oven light and a glass window in the door will let you check on your food without opening the door. Use glass and ceramic pans when baking. They retain heat better than metal pans and allow you to lower the baking temperature by 25 degrees. Entry filed under: Energy, Food, How-To.